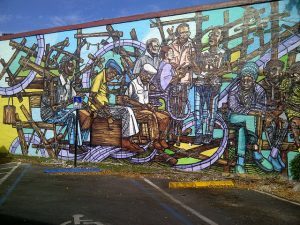 Home » How to spend a day in Little Havana? Posted on February 23, 2019 February 26, 2019 by Rachel A.
Miami is known for being highly influenced by various cultures. Because of its rich heritage, it is called the Capital of Latin America. Furthermore, the city experienced tremendous growth in population with the mass arrival of Cubans. With this in mind, the community of Spanish-speaking people grows every day. Moreover, if you wish to experience this exotic culture, you should head out to Little Havana. You can find it west of the downtown Miami area, and it hides many exciting places and activities. Also, if you are planning to spend a day in Little Havana, we can suggest some ideas! What to do when you want to spend a day in Little Havana? Little Havana’s central part is called Calle Ocho. Here is where you can find brightly painted roosters or local art galleries. Also, you can be a part of the famous Walk of Fame in honor of famous Cubans. Furthermore, here you’ll see the center of Cuban life. There are many local restaurants and bakeries to visit. Moreover, Calle Ocho is home to Cultural Fridays. Here is where the best of Cuban artists gather, presenting their art. Also, there is a Carnival on Calle Ocho. It is one of the largest of Miami’s street festivals. A mix of culture and music awaits anyone who wishes to have a good time. You cannot spend a day in Little Havan and not go to Calle Ocho! Locals call it the Worlds Most Famous Cuban Restaurant. 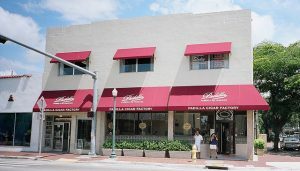 Versailles is a part of the culinary tradition in Little Havana. For example, this is the place to go if you wish to experience authentic Cuban cuisine. It is another way to learn more about Cuban culture, and a perfect place for all food lovers. One of the best items on the menu is a Cuban sandwich. Next, you can order some ropa vieja, croquetas or lechon asado. Cuban cuisine is diverse and abundant with exotic flavors. With this in mind, if you wish to spend a day in Little Havana, start your morning with a cafe Cubano, empanadas and guava pastries. Another way to spend a day in Little Havana is to learn how Cuban cigars are made. All the way through Calle Ocho you will find many family-owned cigar shops. One of the most popular is El Titan de Bronze. The tradition of cigar rolling is old, and it’s secret stays within the family. Each shop specializes in different types of cigars. So that would be pretty interesting to see, right? 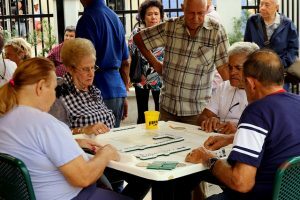 Playing dominos with locals is a perfect way to become a part of Cuban culture. Maximo Gomez Park is a lively meeting spot for all domino lovers. For example, you can find many Cuban retirees drinking coffee, talking and having fun. Nevertheless, don’t hesitate to join them and play a game or two. You might hear amazing stories from their lives, and learn more about Cuban culture. However, we must warn you to expect some serious competition! These players are tough, and you might hear some trash-talking from table to table! Besides, if you only wish to spectate, there are benches close by made for that purpose. The park got its name after a famous soldier, Maximo Gomez. He was a fighter for Cuban independence from Spain. If you wish to spend a day in Little Havana, do not forget to watch a live performance at Cubaocho. Besides being a live performance stage, this is also a cultural center and an art gallery. Inside you can find an old Cuban cigar bar. Walls are decorated with Cuban artwork, and the atmosphere is vibrant and joyful. Have a good time mingling and dancing with locals and other tourists. Cubaocho is a popular tourist spot. Furthermore, if you are lucky, you can attend events like film screenings or drama performance. One of the most popular ways to spend a day in Little Havana is to attend a culinary tour. For instance, experience immersion into Cuban cuisine through samples of Cuban sandwiches, picadillo-stuffed empanadas, mojitos and plenty more at local restaurants in the area. Also, you have the opportunity to learn about the district and its historical significance. Little Havana is full of historical gems, and you just need to know where to dig to find them! We save the best for last! 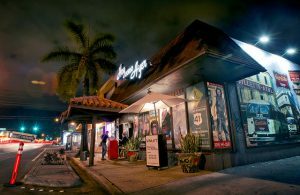 For example, Hoy Como Ayer is the name of one of the most popular clubs in Little Havana. It is an exclusive spot where you can experience true Cuban spirit. The name translates to Today Like Yesterday, and you can find many people inside dancing to Salsa and Latin funk music. Are you deciding to move to Miami? If you are deciding whether to move to Miami or not, this little guide might give you a hint of all the fun that awaits. If you need any help with your relocation, be sure to check out affordable storage Miami solutions. Finding cheap storage units can make a difference when moving. Say hello to my Little Havana! We wish you to spend a day in Little Havana filled with fun, joy and tasty food. Furthermore, learn about Cuban culture and spend some time with the locals. Also, don’t forget to have a good time! Visiting this exotic and colorful part of Miami will be an experience to remember!